Chuckanut Transition: Growing resilient community in the Samish Watershed. Sign-up to receive our monthly Chuckanut Transition e-newsletter and weekly Bow Little Market e-newsletter (while in season). Chuckanut Transition (CT) is a growing network of rural and capable folks that are learning to live more cooperatively with one another and our natural world here within the Samish Watershed. Our goal is community resilience, the ability for us all to cope with, adapt to and overcome challenges. We are responding to such global concerns as economic instability, climate change and resource depletion by addressing the immediate needs of people and resources within our watershed. Our strategies focus on localized, small positive actions that build formal and informal economic networks as we connect , share, learn and celebrate together. All hope lies in our ability to connect with place. Essentially, by becoming indigenous to place, we are creating lives that are more meaningful, healthy and joyful. The Chuckanut Transition Group believes that by creating a deep connection with our forested hills, farmed flood plain and the waters that unite it all from mountain to bay, by connecting neighbor to neighbor, by creating reciprocal and reverent relationships with the human and non-human world, we are not only taking steps to heal the grave imbalances that threaten us all at every turn, but also to heal ourselves and our communities. Our monthly initiating committee meetings are the first Monday of every month. If interested email us at chuckanuttransition@gmail.com or call 360-724-0392. Join us at any point throughout the evening. Bring something to swap, preserved food, medicine or seed, something you made, or a useful item from your household. Main swap hour is from 5 to 6, but wheeling and dealing can go on all evening. Bring something to share at the potluck, food, poetry, story, or a few words of inspiration all appreciated. 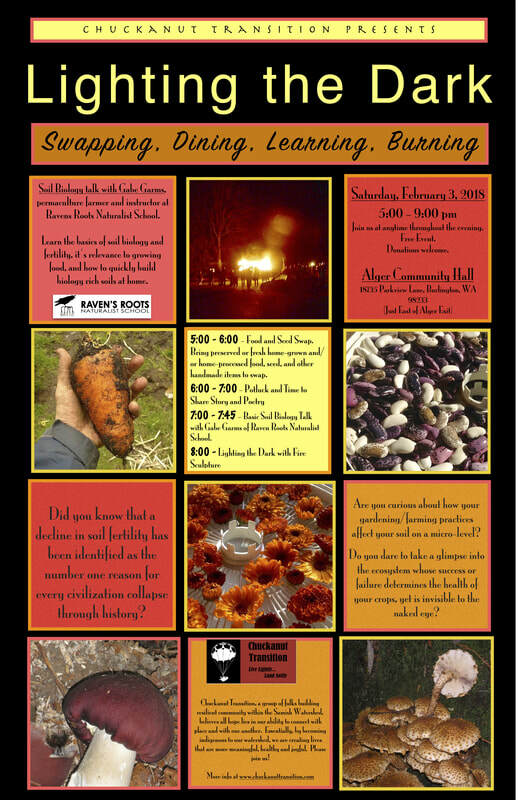 Bring a donation for our guest speaker Gabe Garms of Raven Root's Naturalist School. Check out his website to learn more about him, his farm and his educational opportunities. Bring something to burn. If interested in submitting your own fire sculpture for the evening burn, contact Chuck Nafziger for prior approval at canafziger@hotmail.com. You can also bring a candle and/or a musical instrument to help LIGHT THE DARK.